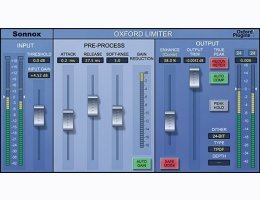 The Oxford Limiter v2 has been developed from decades of professional audio experience to provide a very high degree of quality and facility in programme loudness control and limiting functions. By employing highly accurate logarithmic side chain processing, along with innovative adaptive timing functionality using look ahead signal acquisition, the limiter provides exemplary performance, whether one is seeking general transparent level control, programme loudness maximisation or heavily applied artistic sound effects. The limiter plug-in comprises of four cascaded processes in the order below. Reconstruction metering and compensation section. Dithering and noise shaping section. The Pre-process section is a musical programme levelling function. Its primary purpose is to control programme level over a wide range in order to provide optimum conditions for the following enhancement stage. When the enhancement is disabled in normal mode (at 0% with Safe mode deselected) the pre-process section can be used as a conventional levelling section in it's own right. The purpose of the enhancement process is to provide sample value limiting and overall programme loudness improvement. The process follows the pre-process section in the signal path and is controlled by a separate fader from 0% (no action) to 125% (maximum action). In normal mode the range from 0% to 100% fades in the effect to full level, at which complete sample value limiting occurs. Settings from 100% to 125% further modify the process to progressively increase loudness and programme density at the expense of increasing potential distortion artefacts. Safe mode is provided to allow absolute peak level control without excessive enhancer action, even when using slow attack settings. In Safe mode the enhance process is set to run permanently and the enhance slider modifies the action of the process (rather than the proportion of the effect). Setting ranges from 0% to 100% control the degree of programme loudness boost generated by the enhancer. The control region from 100% to 125% works identically to normal mode. It should be noted that in safe mode signals at all levels are being processed permanently, therefore some minor changes to the programme dynamics can occur even for a minimum setting of 0%. The enhance process improves the perceived loudness and presence of the programme by modifying the dynamic and harmonic content of the signal. Since the method used is different from the pre-processing section, it can further enhance the perceived volume of a previously processed signal whilst suppressing all signal overloads. As the limiting action does not involve conventional sample value clipping, harsh distortions are avoided and programme detail and dynamic information is largely retained. The addition of an attack timing control is a significant departure from conventional limiter applications. The attack control provides a means of increasing the attack time to achieve a favourable improvement in the sonic qualities of the peak reduction process by allowing peak programme transient events to escape hard gain reduction. Since the plug-in has internal headroom these overshoot peaks are retained and not clipped. When the Recon Meter is selected the meter is switched from conventional peak sample value mode into reconstruction mode. In this mode peak reconstruction levels will be displayed on the meter. Levels in the red overload range of the meter represent the presence of potential reconstruction errors. The finite mathematical precision provided by digital audio systems and the effects of dither have been a source of confusion in the audio community for some years. When dither is applied, any signal related error caused by finite word length limitation is turned into constant random noise with no relation to the signal itself, so such dithering provides complete removal of harmonic distortion due to precision limits. With the Oxford Limiter, we provide conventional 16 and 24 bit TPDF dither options. In addition, the Oxford Limiter also provides several types of Noise Shaping dither. Noise shaped dithering is a mechanism that aims to reduce the perceived loudness of the noise of a dithered signal by either forcing the spectrum of the noise out of the audible range or placing it into frequency ranges to which we are less sensitive. In this way the noise at very low levels may be reduced and even lost entirely if it is at the limit of our hearing within ambient noise conditions.